Bring your family for a day of fun and laughter at LEGOLAND® MALAYSIA RESORT! From 15 October to 31 December 2018, get your admission tickets online or onsite with Maybank Cards to receive 30% off admission tickets. Promotion is valid to Maybank Cardmembers where payment is made with a Maybank issued Mastercard®, Visa, American Express Charge, Credit or Debit card that is issued in Malaysia, Singapore, Indonesia, Philippines, Cambodia or Brunei. 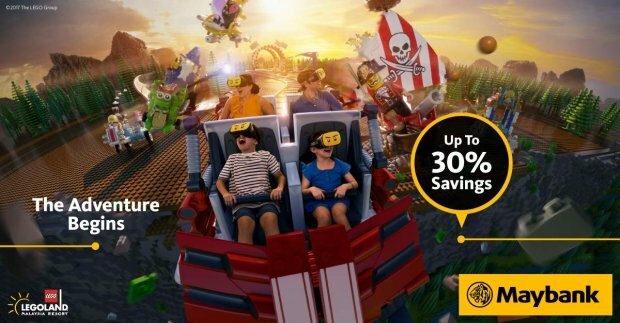 Promotion is valid for LEGOLAND Malaysia Theme Park + Water Park Combo Ticket, or LEGOLAND Malaysia Theme Park only Ticket. Offer does not include Water Park only Ticket. Promotion cannot be combined with pre-purchased tickets, online sales and any other discounts, rebates or promotion including Mykad promotion, Annual Passes, groups and education offers. Ticket prices and operating hours are subject to change without prior notice. Toddlers: age 3 years old and below, Child: 3-11 years old, Adult: 12-59 years old, Senior Citizen: above 60 years. For Toddlers, RM11 is chargeable for mandatory swim diapers upon entry to the Water Park. Kindly proceed to Water Park’s ticketing window for purchase and proof of below 3 years old will be asked for verification. Maybank is not the supplier of the goods or service(s) and makes no representation as to the quality of the goods or service(s) provided. 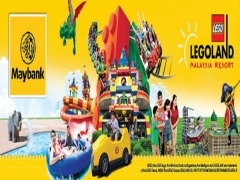 Maybank shall not at any time be responsible or held liable for any loss, injury, damage or harm suffered or incurred by or in connection with the use of the LEGOLAND Malaysia Resort’s goods or service(s). Purchases must be made with minimum 3 days in advance prior to the date of visit. Admission is only valid on the selected date of visit. No changes are allowed after confirmation. Ticket cannot be refunded or exchanged for cash and is not meant for any resale purposes. Up to eight (8) one-day Ticket (Adult/ Child/ Senior Citizen) per transaction. Promotion is valid upon purchase of one-day tickets at LEGOLAND® Malaysia Resort’s ticketing counter. Onsite Promotion Period: 15 October till 31 December 2018. Admission is only valid on the same day of purchase. Up to four (4) one-day Ticket (Adult/ Child/ Senior Citizen) per redemption. Head to Maybank Promotion for more details about this offer and to see all deals up for grab!